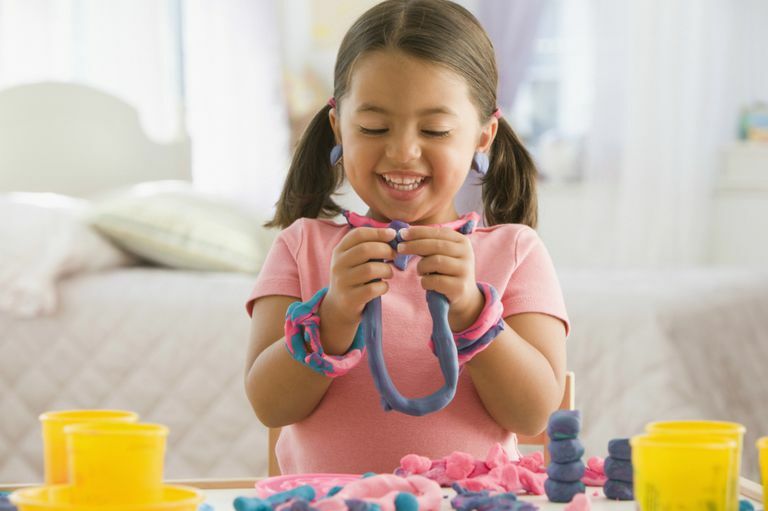 Beyond keeping your toddler occupied as you take care of things around the house, play dough is a great toy for creative play and many aspects of child development. Perhaps most obviously, it helps small children strengthen the muscles in their hands through squishing, rolling, and shaping the dough, which will set them up well to eventually hold a pencil and write, or cut with scissors, or make arts and crafts. This also helps strengthen their hand-eye coordination. In addition to that, play dough encourages children to explore their imagination by creating different shapes, such as foods, animals, or other objects they think up. It can also promote healthy emotional development, as squeezing and flattening the dough can be a safe outlet for angry or agitated energy—and it can be a very calming activity for young children. Like any toy, however, play dough poses a few risks, so it's recommended that you wait until your child is two years old before you introduce it. Play dough bought at the store comes with an age recommendation of two years and up. Homemade play dough is also soft and malleable, and it's pretty easy to make. Harder modeling clays are typically recommended for children at least five years or older because they pose a greater choking hazard. Why Wait Until a Child Is Two Years Old? Oral exploration decreases. Your child is less likely to want to continuously put play dough in her mouth or eat play dough after the age of two since her desire to explore things with her mouth is decreasing. If your child does decide to put play dough in her mouth, it's probably harmless. However, it can be a problem if your child has consumed a large quantity of play dough, which can make even the most basic ingredients like salt a toxicity risk. While it's unlikely that your child will eat an entire batch of play dough unbeknownst to you, you should still know the risks. Verbal understanding increases. As your child gets older, she understands more verbal commands and explanations. An eight-month-old is less likely to understand "Stop" or "No" than a two-year-old. They start to comply. With all that verbal understanding comes a greater chance that your child will actually comply with your requests to stop putting play dough in her mouth. While that request is an important one in terms of safety, there are other requests you're going to want your toddler to comply with as well, like "Don't throw the play dough;" "Don't stick the play dough in your nose;" "Don't smash the play dough in your brother's hair;" "Don't step on the play dough that you just dropped on the carpet." Never feed play dough to the dog, who will probably like the taste. There's less chance of an allergic reaction. Commercial play dough is made with wheat ingredients, as are most homemade varieties. Some homemade play dough recipes call for honey, which should never be consumed by children under a year old, peanut butter, and other ingredients your toddler may not have been introduced to yet. Determine whether or not your child will have a reaction to these foods before playing with play dough. It's more developmentally appropriate. Of course, the safety concerns of play dough are important, but it's also not likely that your child will have the cognitive or motor skills to really enjoy or get anything out of playing with play dough until they are around two years old anyway. In fact, play dough might bring them more frustration than fun. A good pre-play dough activity for younger babies and toddlers are feelie bags. Like play dough, these toys encourage motor skills and offer tactile stimulation. Even though the age recommendation for play dough is two years old, this doesn't mean they can play on their own. A child this age still needs constant supervision when playing with play dough, as with any toy that has the potential to cause choking or induce poisoning, no matter how unlikely it seems. Every toddler toy and activity is made safer under a parent's watchful eye. National Association for the Education of Young Children - Promoting excellence in early childhood education. Playdough Power.